There just isn't any generous way to put it. Much of the opposition to government social programs derives from the ignorance of the electorate and the willingness of conservative politicians to pander to that ignorance. It's little wonder that low-information voters oppose generic government aid programs. 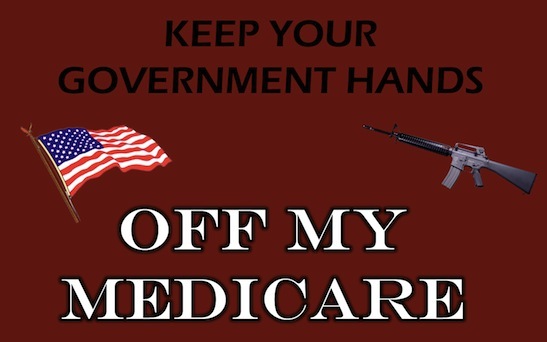 They have little understanding of what those programs are and who is benefiting from them. 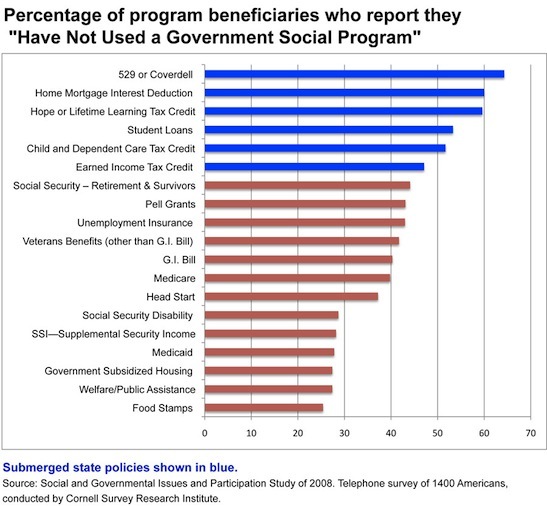 Ill-informed conservative voters seem to think that only freeloading slackers receive government benefits when in fact the better known programs primarily benefit (90%) the elderly, disabled, and working families. "Real" self-reliant Americans are also largely unaware that they themselves have likely benefited from submerged state subsidies. Ignorance may be bliss, but it doesn't make for sound public policy. All the lines in blue are government tax incentives that allow participants to keep more of the money they earned and are not transfers of dollars from someone else. It's an issue of who's definition of 'government social program' is reality and this piece shows that either side is willing to paint this wall in the colors to their liking with rhetoric. On the contrary, whenever anyone receives a special dispensation whether it is in the form of a tax incentive or a direct benefit, all other tax payers have to make up the difference or it adds to the deficit. One dollar of tax credit is one dollar of tax expenditure and is one dollar of income redistribution. If you take the view that the government budget is fixed, yes then when someone gets a special dispensation it needs to be made up by other tax payers but none the less, it does not represent a direct transfer of wealth from one group of individuals to others. By far the biggest special dispensation is the progressive tax code with low income paying no taxes, the low middle paying a modest amount, and the middle high and high income earning salaries reported on W2s paying the most. Energy efficiency tax credits / deductions were not listed either. BTW - I'm in favor of a more progressive tax than what we have currently and agree with your main point about the hypocrisy but think you weaken the argument by selectively including some data on social programs and not others, particularly where the 'social program' label is a bit dubious. Thanks for your further thoughts. I have a couple of quibbles, perhaps mostly semantic. I have no children, so I do not get certain deductions that people with children get. That represents a direct transfer of wealth from me to taxpayers with children. All taxes are transfers of wealth. That, indeed, is at bottom the main purpose of government. I think the phrase "low income paying no taxes" could mislead the unwary. (I assume you used the phrase as shorthand for "no federal income taxes excluding payroll taxes.") A common pander of Republicans is that almost half of U.S. households pay zero income tax. This is a pander because it ignores payroll taxes which are in fact taxes (ask anyone who pays them) and they are regressive, hitting lower income earners the hardest. See the post 'Effective vs Marginal Tax Rates' where the chart shows that effective tax rates (payroll taxes included) are essentially flat once income exceeds about $50,000 which, of course, includes much of the middle class. Progressive effective tax rates were eliminated by the Reagan and Bush II tax cuts for the wealthy. My use of the term 'social program' conforms to its use in Prof. Mettler's survey.